(Mysterious places on earth) Our beloved Earth is completely full of beautiful waterfalls, scenic mountains, serene rivers, fantastic forests and so much more. Existence and occurrence of most of these places can be understood in terms of science and history. But, there are many places on this planet that are truly enigmatic and deeply mysterious. Though some light has been thrown on some of these places, due to recent technological advances. But still, there are some seemingly unearthly places that have no proper explanation or accountability. Some people might even believe that they don’t exist at all, as they are not that easily accessible. Hence, below are listed 5 most mysterious places on Earth! At number 1 in the list of most mysterious places on earth is the Magnetic Hill. Magnetic Hill is located in Ladakh, India, in the state of Jammu and Kashmir. It is actually a short uphill road of around 30 km situated on the Srinagar-Leh highway. What is so fascinating about this road is that while traveling on it, if you let your vehicle stand still, it will start moving on its own. Some people have reported acquiring speeds of more than 15 kph with their vehicle engine turned off, on this road. Many researchers believe that this happens due to an optical illusion. The surrounding area and the setting of the road are such that it appears as if the road is uphill. While in reality, it is actually downhill, making vehicles slide without external force. This hill is also called as Gravity Hill. One simply cannot ignore the Bermuda Triangle when it comes to mysterious places on earth. This site has baffled people for more than 5 decades now. It is located in the North Atlantic Ocean and covers roughly 500000 square miles, near the southeastern part of Florida. Countless accidents and disappearances of flights and ships have been reported to take place in this region. This region is one of those few places on Earth where a compass points towards the Geographic north instead of the Magnetic north. Many people consider the Bermuda Triangle as a sector of supernatural and paranormal activities. Due to its catastrophic incidents, this place is also called the Devil’s Triangle. 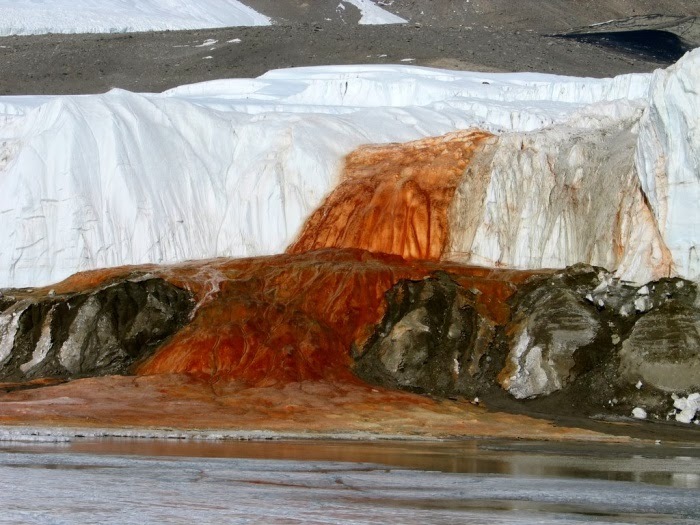 Blood Falls is located in Antarctica, a continent that is different and mysterious in its own sense. The falls is basically blood red in color, that originates from the snow white Taylor Glacier and flows to West Lake Bonney. The phenomenon was first observed by a geologist named Griffith Taylor, in 1911. This surprising effect of the existence of red colored water in a place entirely covered in ice actually occurs due to iron oxides. The source of the falls is a submerged pool of salt water that is rich in iron, thus giving a blood-red hue. Though all other places on this list are naturally occurring, Area 51 is a place completely developed by humans. Area 51 is a sector of United States Air Force in the southern part of Nevada. The reason this place is one of the most mysterious places on earth is that the primary purpose of the area is not yet known. It is a highly restricted area and speculated to having possession of UFO spaceship parts. 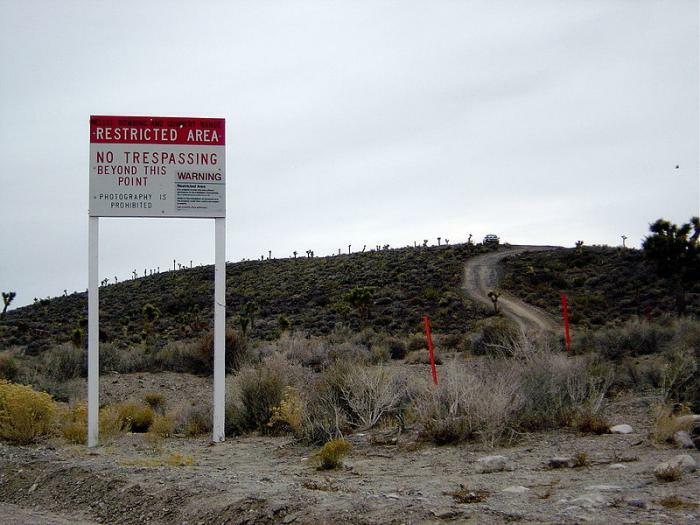 The U.S government has been zip tight about this, and Barack Obama was, in fact, the first President to ever confess about the existence of Area 51. Roopkund is a glacial lake based in the Himalayas, in India. Located in the state of Uttarakhand, Roopkund is a famous trekking spot. 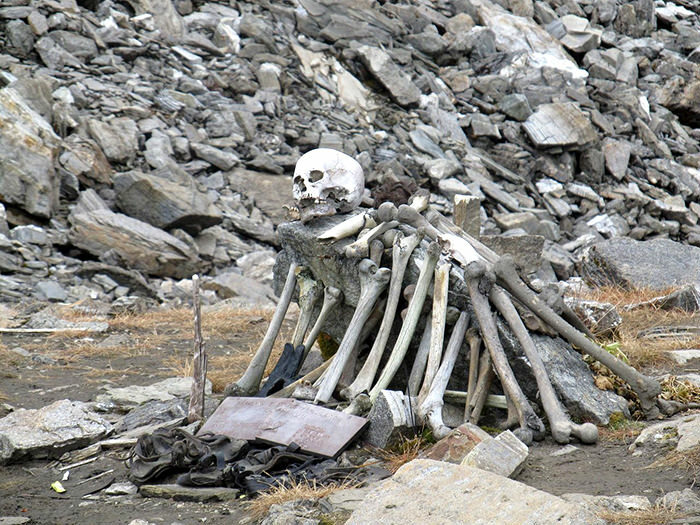 This shallow lake has become special because of hundreds of human skeletons found at the bottom of the lake. There are many stories about how the skeletons got there and whom they belonged to. Studies have found that skeletons are of people from the 9th century. Apparently finding this lake in the middle of nowhere is quite a tedious task.